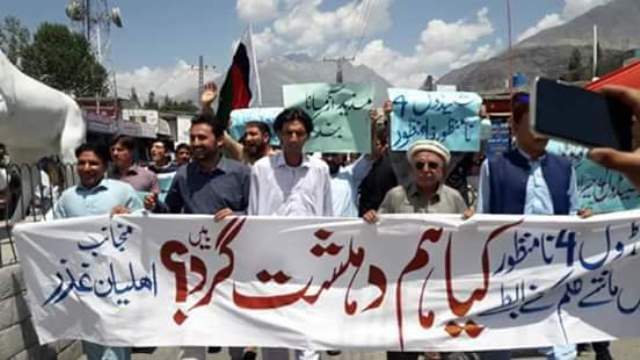 GILGIT: People of Gilgit Baltistan rejecting the unlawful implementation of Schedule 4th on peacful socail and political activists. Rallies and protest marches have been started across GB. Thousands of people gathered at Yadgare Askardu and expressed their strong concerns and demanded to uplift this black low from GB. While addressing to protesters speakers said that this law was used against terrorists and anti-state actors but Govt was using this law against their political opponents and innocents activists. By this type of tactics, Govt want to keep students and social media activist underpressure who demand constitutional and basic Human rights for suppressed GB people. People in Gahkuch the district headquarter of Ghizer also arranged a Rally and Protest against idiotic and unjustifiable implementation of SCHEDULE IV on Peaceful social and political workers of Ghizer Recorded at Press Club Gahkuch.